The overall UK tool distribution market is highly fragmented and consists of a variety of products distributed through a very broad range of distribution channels for end-use in both domestic and non-domestic sectors. The distribution market for tools is expected to reach a value of £1.2billion by 2018. Higher levels of construction, house building and RMI work – along with product innovation – supported relatively high value growth of up to 7% per year until 2014. This positive trend has continued between 2015-2017, with growth supported by a reasonable economic performance and higher levels of construction leading to market growth of 3-4% per annum, in value terms. The performance of the tool distribution market is influenced by tool replacement cycles and activity levels in new build and RMI, as well as a range of industry specific influences such as product development and legislation. Also assisting growth in recent years has been the trend away from do-it-yourself (DIY) to get-someone-in (GSI), as professional tradesmen tend to purchase higher value and quality tools, and also tend to replace tools more frequently. Home improvement multiples represent the major channel for householders, although tradesmen also use this channel, and are estimated to account for over 30% of the tool distribution market in value terms. Industrial and consumable products distributors also account for an estimated share of more than 30% and are generally used by the professional contractors, although Screwfix, for example, is also used by consumers. These are followed by tool specialists and the online, catalogue & mail order channel. Some tool specialists have continued to expand both their network and their online presence in recent years and increased their market share, while specialist e-tailers also continue to grow. In recent years, buying behaviour has been markedly influenced by digital technology, and operating a transactional website has become increasingly important, with the internet emerging as a key channel in its own right. Home improvement multiples have responded to changing customer needs faster than some others, and have adopted a multi-channel approach, incorporating brick-and-mortar, mobile and internet, catalogues and click & collect channels. The tools market is relatively evenly split between power and hand tools. While hand tools is a mature, steady sector with little significant step change in product development, power tools have significantly benefited from new products and product innovations, such as cordless technology, lithium-ion batteries and brushless motors, all driving sales. A wider range of tools suitable for all budgets and capabilities are now available and has led to distributors’ stock levels increasing in recent years. It is estimated that the professional tool sector holds the majority share of the market, accounting for an estimated 70% share. The following chart illustrates our estimates of the mix of professional and DIY tools by value in the construction and RMI sectors in 2017. This is, however, an indicative estimate only, since analysis is complicated by a number of factors, including the fact that the precise definition of which tools are considered professional or DIY tools is open to interpretation, in many product categories. DIY outlets now increasingly also offer professional tools, while more trade-oriented outlets offering DIY tools. Branded power tools are popular with contractors, and product developments have assisted growth in this sector, with contractors tending to be quicker to take up product developments than the DIY sector. Competition for branded products is intense, and the internet channel has facilitated the purchase of branded products at competitive prices. In this sector, there is a growing tendency towards ‘visible pricing’, whereby the price is transparent rather than offered as a substantial discount based on a higher price. It is estimated that the DIY sector accounts for an estimated 30% share of the tool market. The shift towards GSI has seen the DIY tools sector lose some share in recent years, and, whilst branded products and product innovations have been taken up in the DIY sector, products tend to be less expensive than professional alternatives, which impacts on market value. Within the DIY tools sector, discount multiples have recently gained share, something which has impacted on prices and market value. 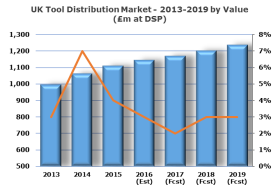 Prospects for the overall tool distribution market are generally positive, with moderate growth expected in the domestic sector and also across some non-domestic construction sectors. Steady demand in the garden tool sector is also expected to underpin the market. We estimate that the UK tool distribution market will continue to grow by around 3% per annum to 2021. While forecasts for the construction and RMI sectors to 2021 are for lower levels of activity, prospects for infrastructure, education, entertainment and housing are reasonably positive and should provide opportunities in both the professional and DIY tool sectors. Product development is also expected to continue. 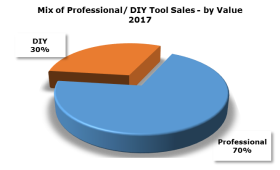 • More information is available in AMA Research’s report ‘Tool Distribution Market Report – UK 2017-2021 Analysis’. To order the report visit www.amaresearch.co.uk or call 01242 235724.